A group of north Floridian high school and middle school athletes competed against collegiate athletes at the Embry-Riddle Indoor/Outdoor Challenge on Saturday. Here is the run down on how athletes performed. 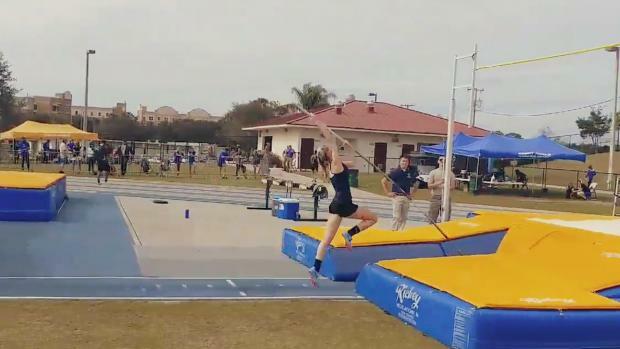 Jacksonville Athletic Club dominated the field events with nine girls placing in the high jump, pole vault, long jump, and triple jump combined. Audrey Wuerffel won the pole vault finals in 10-6 with recent Vanderbilt signee, Madison Murray, following behind in 10-6 as well. Murray took second in the high jump with her 5-1 performance, and seventh in the long jump. On the boys side, Jamar Houston represented Power House Athletics with his third place finish in the high jump with his 6-0 mark and fourth place in the long jump in 21-11. IMG Elite senior, Shichen Wang finished third in the mens long jump with a 22-0.75 to start off his outdoor season. IMG Elite boys brought the competition in the shot put with three athletes in the top 15, with Ruben Banks leading the way in a 45-3.75. Luke Witte of IMG elite finished fifth in the discus with a 140-2 mark to seal the deal. Central Florida Gliders seventh grader, Noelle Vu, demonstrated that Florida's youth is very fast heading into this outdoor season. Vu placed third in the mile run with a fantastic mark of 5:41 against women who are nearly a decade older and seventh in the 800m in 2:35. Claire McDonnell of Father Lopez finished fifth overall in the mile run in 5:47 with Ocala Vanguard sophomore, Emma Kate Peterson right behind in 5:52. McDonnell's teammate, Mary Peck, finished third in the 3000m in a time of 10:57 -- a PR for the freshman. On the boys side, Ocala Vanguard HS junior, Lewis Benitez-Chaparro, finished third in the mile in a time of 4:39.86 -- with a PR in the 1600m of 4:34, Benitez is ready for a strong outdoor season ahead of him. Hannah Douglas, Evolution Speed TC, brought the heat in the 60m dash with her third place 7.90 finish -- a great time for the sophomore. With Camron Wright, of Daytona Express track club, right behind in 8.10. Douglas and her teammate, Jade Blake, took fourth and fifth in the 200m with Douglas going 25.22 and Blake, 26.39. Evolution Speed also had freshman, Aliya Green and Lauren Guthrie, go 27.26 and 27.84. Green took that 200m speed and applied it to the 400m where she finished third in a time of 1:01.35 with Ocala Vanguard sophomore, Jillian Kay, racing to fourth place in 1:02.22. Power House Athletics brought the competition on the boys side. Tobias Durham finished ninth in the 60m in 7.17, third in the 200m in 22.49, and seventh in the 400m in a time of 51.03. Brenden Sius, of Power House Athletics, finished sixth in the 400m and the first high school athlete to cross the line in 50.76. Sius competes for Olympia HS during the outdoor season and was 0.6 away from his PR at the start of his senior outdoor season. Maurice Booker, Sius Olympia and Power House Athletics teammate, finished 11th in a time of 52.02 for the 400m with Ocala Vanguard sophomore, Jordan Travieso, right behind in 52.49.